A woman experiencing an extreme haunt doesn’t take its abuse lying down in an exclusive excerpt from EXTREMITY, releasing today on VOD and collector’s edition Blu-ray. See it after the jump. 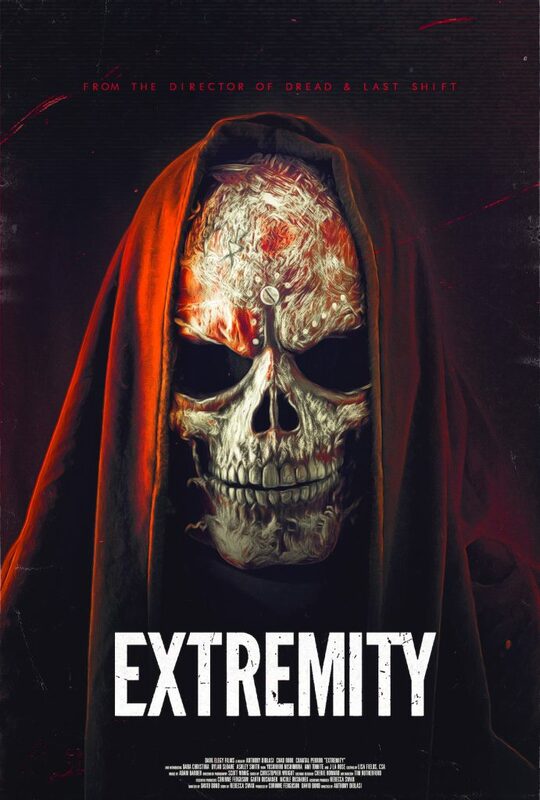 Released by Epic Pictures under the Dread Central Presents banner, EXTREMITY was directed by Anthony DiBlasi (Clive Barker’s DREAD) from a script by David Bond and concepts by Scott Swan. The cast includes Dana Christina, Chad Rook, Ashley Smith, J. LaRose (the INSIDIOUS and SAW franchises), Ami Tomite (MEATBALL MACHINE KODOKU) and cult gore filmmaker Yoshihiro Nishimura (TOKYO GORE POLICE, HELLDRIVER), who also created the makeup effects. Simon Sayce (HELLRAISER, NIGHTBREED) crafted the masks worn by the haunt’s denizens. The synopsis: “Allison [Christina] is an emotionally troubled young woman in her 20s, who believes that confronting her trauma might be a means of exorcising her demons. She signs up for a trip to Perdition, in which the only certainty is the promised experience of absolute, unadulterated terror. But the most purely frightening thing on display will prove to be Alison’s own twisted psyche…” See our review of EXTREMITY here.